WASHINGTON (AP) — As North Korea intensifies testing of its ballistic missile technology, a U.S. website said Friday it also sees further signs from satellite imagery that North Korea is looking to produce more plutonium for nuclear weapons. 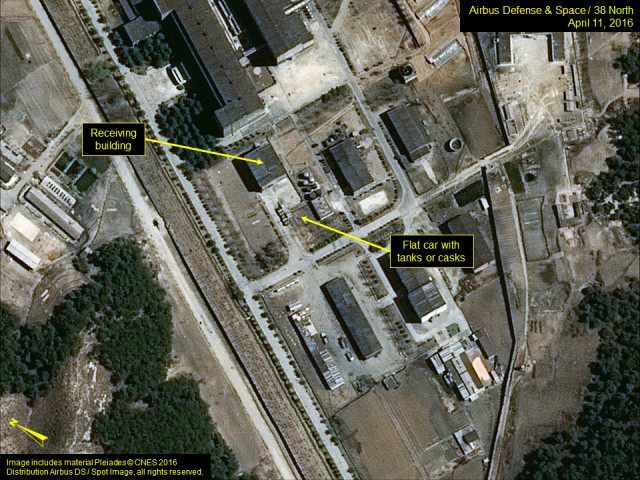 The website 38 North, which monitors sites in North Korea associated with its weapons programs, says that an image taken Monday at the Nyongbyon nuclear complex shows a rail flatcar at radiochemical laboratory complex where the North separates weapons-grade plutonium from waste from a nuclear reactor. It says the tanks or casks seen on the flatcar could be used to supply chemicals or haul out waste products. In recent weeks, exhaust plumes have been seen at the laboratory, also suggesting that nuclear reprocessing activity could be in the works. “The presence of a loaded flatcar, together with the presence of exhaust plumes, suggest that North Korea is preparing or conducting a reprocessing campaign to separate more plutonium for weapons,” says the analysis by Joseph S. Bermudez, a specialist in satellite imagery and North Korea’s military. South Korean and U.S. officials said Friday that North Korea conducted a failed launch of what was reportedly an untested mid-range missile that could one day be capable of reaching far-off U.S. military bases in Asia and the Pacific. It is the latest in a series of provocations. The North conducted its fourth, underground nuclear test explosion in January and a long-range rocket launch in February that drew the strongest international sanctions yet against Pyongyang. Last week, the Institute for Science and International Security, a Washington-based think tank, said that there’s growing indications that North Korea is separating plutonium but said it’s hard to say with certainty. It estimated that the reactor could have produced about 5 to 7 kilograms (11 to 15 pounds) of weapon-grade plutonium since its 2013 restart — enough for one to three nuclear weapons. Pyongyang is already believed to have a handful of crude nuclear bombs and is making progress toward having a nuclear-tipped missile that could reach the U.S. mainland.